We've talked about Disney animation from over the generations. From the First Golden Age which began with "Snow White and the Seven Dwarfs" to the Second Golden Age which began with "The Little Mermaid", although if you follow Blue Sky Disney regularly know that I think it started with "The Great Mouse Detective", low box office or not. When will the Third Golden Age begin? And it may not even be all animated. 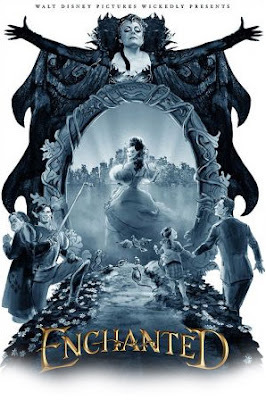 Walt Disney Pictures "Enchanted" is a live-action film with only 15 minutes of animation. But the story is pure Disney and it more than "The Princess and the Frog" marks the return of 2D animation. Now, sadly the animation is not by WDAS... James Baxter Animation, headed ironically by James Baxter is doing the animation. Now James used to work for Disney so that counts for something. You may remember he animated a character known as Belle from a little known film called "Beauty and the Beast" or another animated femme fatal named Jessica Rabbit? If that's not enough then let your fears subside with the knowledge that the animated sequences were overseen by Disney Legend Andreas Deja himself to make sure it was up to Disney quality. The success of this film will hopefully shove a dagger into the back of the statement that "2D is Dead"... from what I've heard and seen it looks rather promising. The problem with animation at the Mouse has ironically never been animation. When you rule by committee and have a large bureaucracy overseeing a story it will come off confusing, complicated and sometime dull. Welcome to the world of Disney animation of the last few years. Not that there haven't been a few gems, but the Suits attempts to stake out ground in the Creatives camp so as to lay claim to a films success was the real reason these films were box office disappointments. Not that people were enamored with Pixar and it's lovely computer animation. Pixar dazzled with amazing visuals, but what people kept coming back for was there attention to story. It appears that "Enchanted" may have captured that long lost art of... story. And if it becomes a blockbuster then we can all know where the Third Golden Age began. I have great hope about Enchanted. All the talents seems to be in the right place with this film. More important: Enchanted don't disclaim the true Disney's elements. This film doesn't has shame to be a trully Disney fantasy. This posture already is a great beginning for me. If the second golden age was the period between The Little Mermaid (or The Great Mouse Deective, which I also agree with) and The Lion King, then what was that period between Cinderella and Sleeping Beauty called? The Silver Age, I think. I understand your point, but I believe the third golden age will begin not with "Enchanted," which I'm looking forward to, but with the new Goofy short, "How to Install a Home Theater System." If anything points to the promise of Disney's future under Ed and John, this could be it. This project might just show everyone that WDFA's artists can still create magic. I always thought that the first golden age began with snow white and ended with sleeping beauty the in the 1990's the second one began with Little mermaid. Yeah, I'm pretty sure Cinderella-Sleeping Beauty was the "Silver Age" (although I'd say Ichabod and Mr Toad-Sleeping Beauty was the "Silver Age" even though Ichabod and Mr. Toad was a package film). "I always thought that the first golden age began with snow white and ended with sleeping beauty the in the 1990's the second one began with Little mermaid." I believe the "First Golden Age" started with Snow White and ended with The Three Caballeros. In between the "First Golden Age" and the "Silver Age" was the "Package Films Age". I'd say the "Second Golden Age" began creatively with The Great Mouse Detective and officially with The Little Mermaid. Who Framed Roger Rabbit was the movie that made animation popular again, though. What do you mean Andreas Deja was "overseeing" the animation ? Then why was it produced at a studio named "James Baxter Animation" ? James Baxter was the guy who supervised the animation and made sure it was up to classic Disney standards. Andreas is a great animator, but he was one animator on the film , under the supervision of the (equally) great James Baxter. Deja is not such a great animator. He's a fine draughtsman, but his acting is derivative, mushy and below average.